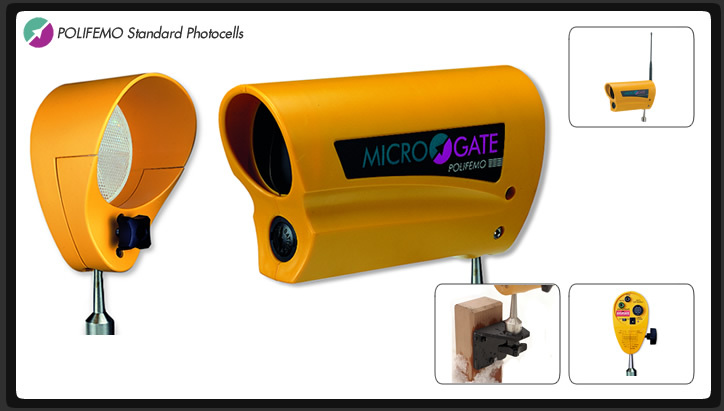 Microgate's Polifemo photocell establishes new standards in photocell performance and flexibility. The high-precision optics and easy-to-install design make these photocells a pleasure to use, and their reliability ensures worry-free timing all day long. Unlike other manufacturer's cells that are nothing more than just a normally-open switch device, the Polifemo line employs an intelligent link to the timer using the standard 2-wire banana connection. Using the cell's built-in dipswitch controller, this connection allows you to use the photocell as an intelligent link to the timer for Starts, Laps, and Stops. The Polifemo cell employs a coaxial optical system guaranteeing a line width of over 35 meters (approx 120') when used with a reflector or up to 90 meters (approx 300') with separate transmitter/receiver. Polifemo photocells can be fitted on request with the TDMF module for remote verification of the battery-charge and signal levels; all information is relayed via the same connection pair as the timing impulse. Also available: the ultra-simple Polifemo Light model, employing most of the features of the Standard model but without the programmability and with a decreased transmit range of approx. 15 meters (50').